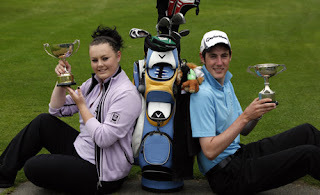 JULIE Ross, eight times the Northumberland champion, talked in Teeing Off recently about a promising crop of youngsters the county have high hopes for. At the time, she was highlighting Nicola Haynes, the 14-year-old over half her age she had just beaten in the women’s final but, as if to underline Ross’s point, another good prospect, Rachel Bruce, 15, from the Ponteland club, has beaten Haynes in the junior county matchplay final. In turn, that has completed a double for Ponteland. Another of their members, 18-year-old Richard Robson-Crosby, has won his county junior matchplay title. This was also a double for the Ponteland professional, Alan Robson-Crosby, Richard’s father and coach, who also coaches Bruce, and quite a tribute to his teaching skills. Two years ago, when Richard was 16, he became the youngest club champion in what was then the 82-year-old history of Ponteland and last year he won the St Andrews Boys’ Open. A pupil at Newcastle RGS, his latest trophy came when he beat Bellingham’s Will Robson 3&2 in the county final. His superior putting, and an ability to get up and down enabled him to ease out to victory against an opponent with top ten finishes this season in the county strokeplay championship and the individual places of the county teams event. Bruce, who goes to Ponteland High School and has a another coach in the Hexham professional, Andy Paisley, was involved in an altogether different sort of final. Like Robson-Crosby’s match, it was played at the Bedlingtonshire club, but this one went to the 19th, where Bruce rounded off a memorable comeback, having teed off at the 15th three down. When Haynes found a bunker and Bruce went through the green, it was Bruce who handled her problem better, bending a wedge round a tree, when 15 yards from the green, to escape with a bogey against Haynes’ double bogey. The 16th was halved, at 17 the margin was reduced to one when Haynes went through the green via a bunker and wiped out altogether at 18, where she drove out of bounds. When it came to the first extra hole the decisive blow was struck when Bruce kept her composure after sending a six foot putt seven feet past the hole. She made no mistake on the return journey.